A Sea of Time is another book sent to me to review. I was contacted by the author's father who asked if he could send this book along with two others. And, as usual, I was not expecting much. But as with The Eternal Footman, I was pleasantly surprised. First of all, A Sea of Time is an easy read. A straight-forward style and crisp narrative makes the book flow well and draws the readers' attention. It is written almost like a short story--just novel-length. Too many new authors attempt to overcome inexperience and a lack of an established following by throwing in so much "literary" style as to render the books almost incomprehensible. Frisbee does not fall into that trap but rather gives us good, old-fashioned story-telling. The novel is part international thriller, part religious philosophy, part time-travel paradox, part alien contact, and part science fact book. The setting begins with the discovery in Turkey of the fossil remains of what seems to be a modern man. This, coupled with an indecipherable message from outerspace starts the Gjerstad Protocol, a contingency plan for dealing with first contact. The plan brings together a handful of people from various walks of life who had been selected, without their knowledge, to form a group which would formulate a response to the first contact trigger. As the group comes together and starts investigating the recent occurrences, love, murder, suspicion among the team members, and a remarkable discovery lead the group down some surprising paths and lead some to make some momentous decisions. One of those decisions seems, in retrospect, that it should be part of every time-travel story, but I have never come across it before in other books. Yes there are some negatives I found in the book. A few were factual (gold cannot be carbon-dated as happened early in the book, for example.) I felt there were a few too many coincidences which were not necessary to the plot-line. And having worked on large government projects myself, I felt many of the investigations were too haphazard and poorly planned. But overall, I think Frisbee did a good job of researching the wide variety of subjects and knowledge presented in the book. His character development was strong, and the pace brisk. Yet within the action, some real philosophical questions were raised. I have read good action books, suitable for a summer read-on-the-beach. I have read deep and insightful books. But I don't often read combinations of the two which work on both levels. So in this, I am quite impressed with Frisbee's effort, and I look forward to reading more of his work. 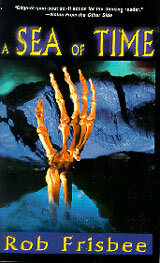 A Sea of Time is available through Dark House Books, a publishing house founded by the author with the aim of assisting new authors get started.